With apologies to Arthur Conan Doyle, of course. The Department of Energy estimates that American energy usage will grow only 10% in the 25 years to 2040. As noted previously, this is despite a projected near doubling of GDP, a 20% increase in population, a 30% increase in vehicle miles traveled and much more. They expect the number of households to increase from 115 million to 143 million, a 25% increase. They expect the square footage of new houses to climb from 1,686 sq. ft. to 1,858. But they expect residential energy consumption to climb by less than one quad, from 20.73 to 21.48 quads. The DOE expects the industrial and agricultural sectors combine to grow from $6.616 trillion to $10.994 trillion by 2040, a 60% increase. But they expect energy consumption in the two sectors to grow from 26.81 quads to 33.53 quads, only 25%. The explanation is simple, if not entirely credible. They expect energy intensity, as measured by thousand BTU per 2005 dollar in GDP to drop from 6.79 to 3.99 between now and 2040. I hope to post soon on the plausibility of this. 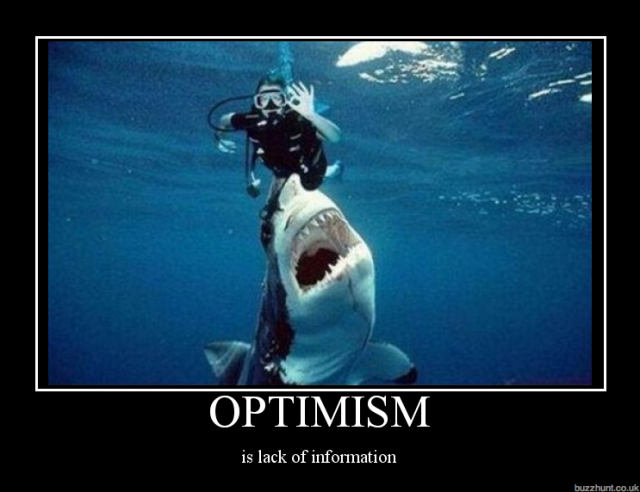 The good news is a bit more important. The DOE EIA has forecast global GDP through 2040. They say it will rise from 2014’s total GDP of $80 million to a whopping $200 million by 2040. I hope I get a piece of it. 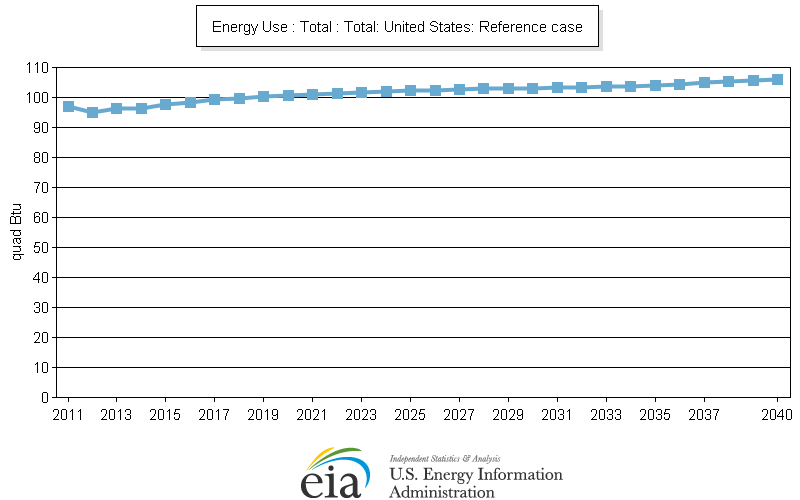 The Department of Energy’s (DOE) Energy Information Administration (EIA) has released their Annual Energy Outlook for the USA with projections of energy production and consumption through 2040. In the report they forecast that American energy use will rise from its 2014 total of 97.7 quads to a total in 2040 of 106.3 quads. 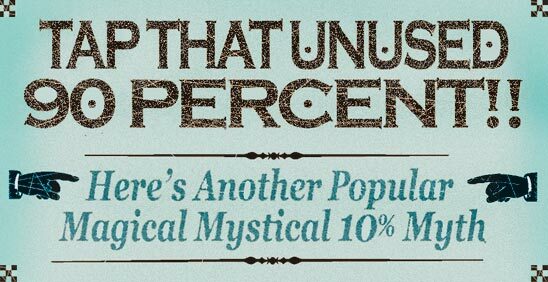 That’s a rise of 10%. 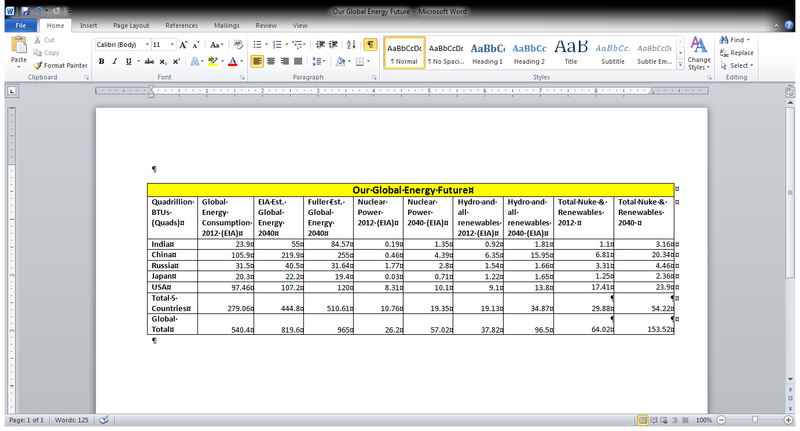 Assumptions are everything when you forecast the future and the EIA is making some assumptions that look almost heroic. They seem to assume that every factor used in estimating energy consumption can rise by more than 10% but that energy use has that hard limit–something I don’t understand. I noted yesterday that they predict that the U.S. GDP will almost double, from its current $14.232 trillion to $26.67 trillion in 2040. I’ll add now that they predict that average personal disposable income is set to rise from $10,755 in 2014 to $19,724 in 2040. Disposable income rises by 75% but energy consumption rises only by 10%? The EIA also predicts that housing starts will rise from 1.31 million in 2014 to 1.66 million in 2040. Housing starts increase by 25% but energy consumption increases by only 10%? Housing starts rise because the EIA predicts that population will rise from 317 million in 2014 to 380.5 million in 2040. Population rises by 20%, but energy consumption rises by only 10%? The EIA predicts annual sales of light duty vehicles to rise from 15.64 million in 2014 to 17.93 million in 2040. 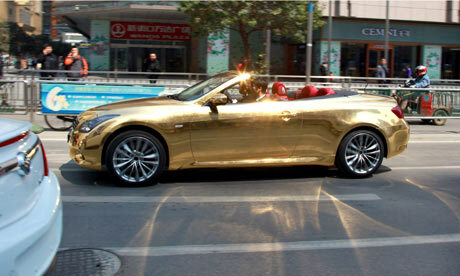 Car sales rise by 15% by energy consumption rises by only 10%? Well, maybe we’ll be driving less? No. The EIA says that American drivers put 2,623 billion miles on their cars in 2014, but that will rise to 3,434 billion miles in 2040. Vechicle miles rise 30% but energy consumption rises only 10%? You get the picture. I’ll be back to look at other sectors tomorrow, I hope. For those of you just tuning in, this year I decided to take a look at what all this newly planned green energy would produce–if it was enough to meet demand. What I found was pretty sad. The five top fuel consuming (and CO2 emitting, for those keeping score) countries are China, the U.S., India, Russia and China will consume about 60% of the world’s energy in 2040 (and account for a similar percentage of emissions. The second five countries account for about 10%, so it really is the top 5 countries that matter. The world got 11.8% of its primary energy consumption via nuclear power and renewables in 2012, 64 of the 540 quads we consumed overall. If my more pessimistic figures are correct, those same 153.52 quads of renewable energy and nuclear power will amount to 15.9% of the 965 quads my projections show we’ll be using. That would leave 812 quads to be delivered by fossil fuels. The Philippines consist of 7,107 islands, which of course makes planning difficult. Rapid development makes it more of a challenge. The Philippine economy grew by a robust 6.1% in 2014. Their population has grown by 45% since 1990, to its present level of about 100 million, but 8 million have been added since 2010. The country is in the midst of an energy crisis, as the growing economy and population have created a demand for energy that outstrips supply. The country is currently experiencing blackouts and rotating brownouts that are causing disruption to people’s lives and the overall economy. The same has happened in many developing countries. The difference with the Philippines is that it has enough wealth to deal with it. But not without controversy. The Philippines already have the most expensive electricity in Asia and prices are rising–something about supply and demand going on over there. This has led to charges of collusion, if not outright corruption, among and between energy suppliers. They are now meeting unexpected high demand by the use of diesel generators, highly polluting and highly emissive of greenhouse gases. So, what are they planning to do about this in the future? 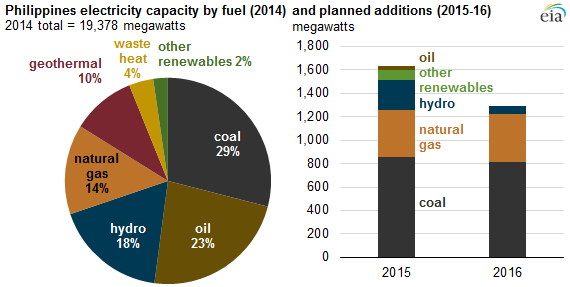 The EIA shows current capacity and planned construction for the next two years. In 2015 they plan to increase capacity by 1,600 megawatts, or 8%, followed by a further addition of 1,300 MW in 2016, reaching about 21,000 MW at end 2016. More than half of their new capacity will be powered by coal–what readers here will recognize as what I have labeled the inevitable reaction to supply shortages. Whether coal ends up being better than diesel generators will depend on what type of power plants they build. But between 2012 and 2013, energy consumption in the Philippines grew by 10%. If growth continues in the same vein, this additional construction will leave them in exactly the same position they are in now. Although the Philippines have significant geothermal production and are working hard on building up solar power, they import half of their primary fuel supply. Once again, we see that inadequate forecasting will leave the Philippines still importing expensive fuel, still facing power outages, still burning diesel fuel in generators to provide electricity–and still facing the same furor over prices, investment and the threat to growth that this situation produces.